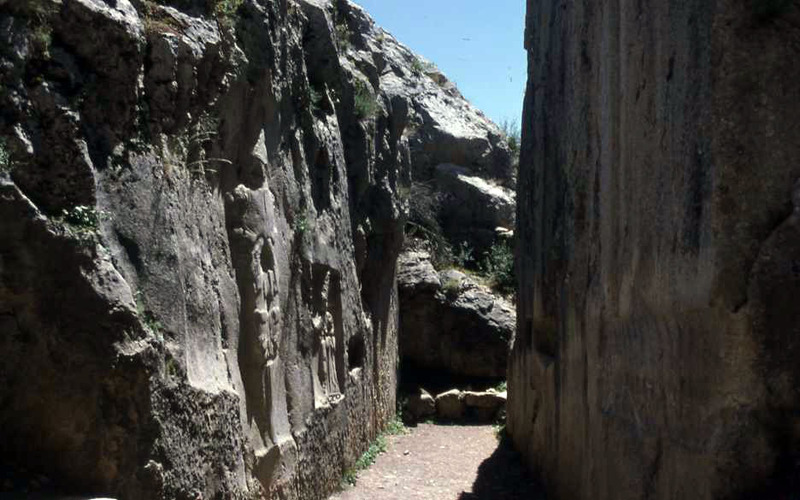 Yazilikaya is an important Hittite archaeological site in Turkey. 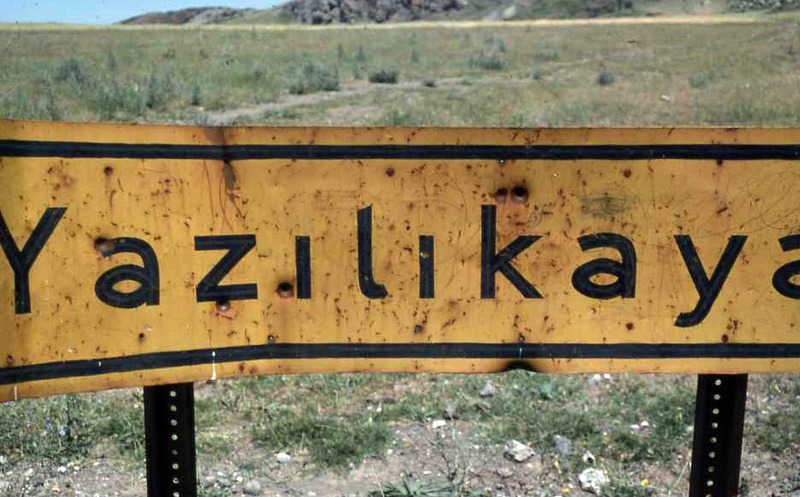 Road sign for Yazilikaya photograph in 1975 by the late Professor Harold Mare. View of the site in 1975. Artistic and inscriptional evidence suggests that the relief images were carved 3400 years ago and that the sanctuary was abandoned 3200 years ago. 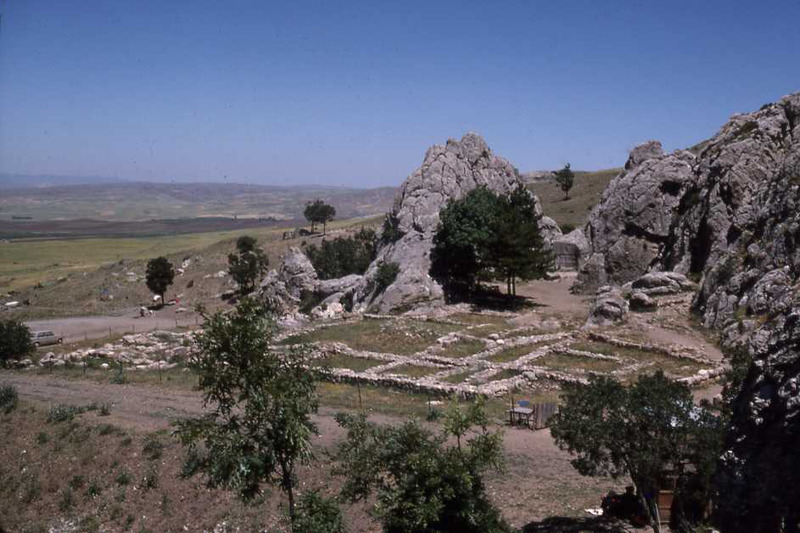 The highpoint of the sanctuary was in the 13th century BC (Seeher 2011:150-151). Reliefs carved into the bedrock in Chamber A. 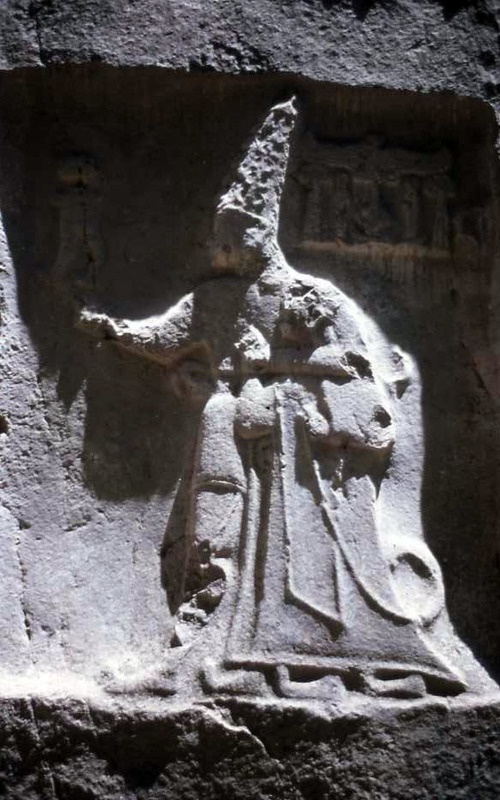 Relief number 64 in chamber A of King Tudhaliya IV standing with each foot on a mountain peak. 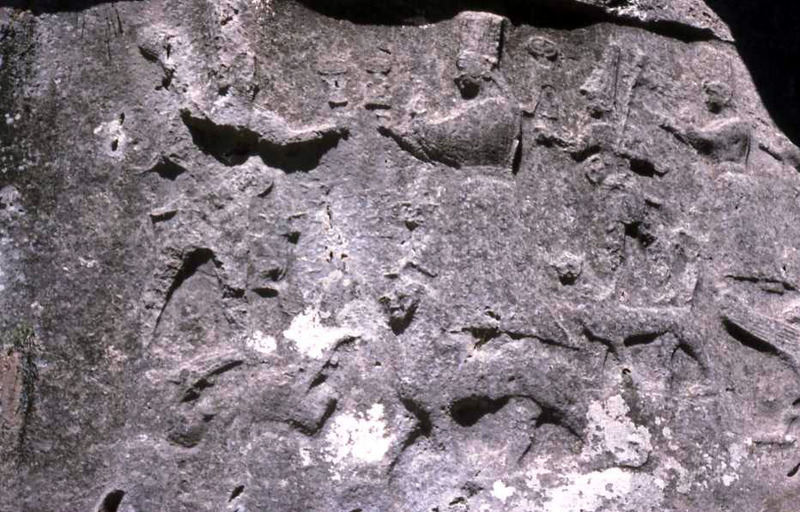 Above the right hand is his name in Hittite hieroglyphs. Seeher (2011: 83) identifies the glyphs framing the cartouche (a tall cone with volute) as the title "Great King" (volute = Great and tall cone = king). The small central image is of a bearded mountain god with his left arm raised; he is flanked on either side by glyphs of a dagger over a flower blossom the royal title of Labarna. Reliefs 42 to 45 that Seeher (2011:Figure 61 to 65) identifies as the climatic scene on the rear wall of chamber A. The right facing god (with a pointed hat) is Tesub, the Hurrian storm god. The left facing goddess (with crown like battlements) is the Hurrian sun goddess named Hebat; wife of the Storm God Tesub (Seeher 2011:65, 67). Hebat stands on the back of a big cat/lion. Behind Hebat is Sarrumma - the son of Hebat and Tesub; he carries an axe over his shoulder and a sword in his belt. Sarrumma, like his mother, stands upon the back of a big cat/lion. The goddess behind Sarrumma is Alanzu, sister of Sarrumma. 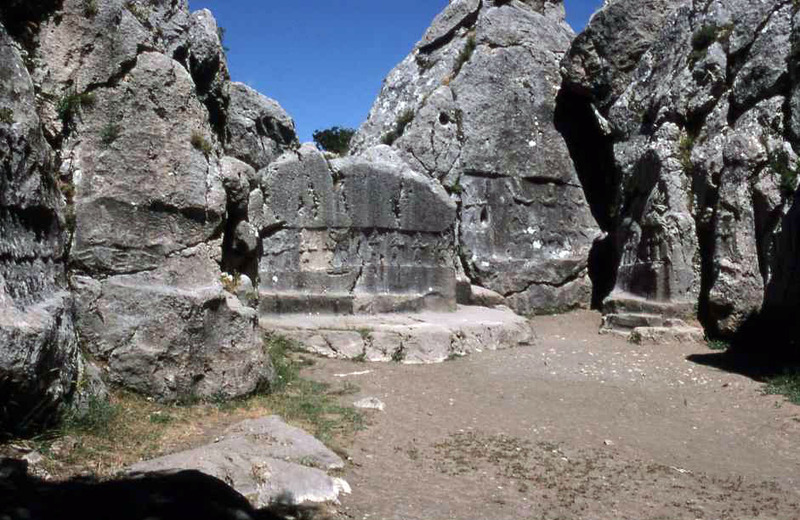 Reliefs carved into the bedrock in Chamber B.
Reliefs 69 to 80 in Chamber B identified by Seeher (2011: Figure 12) as the twelve gods of the underworldcarved from the bedrock at Yazilikaya. The divinities are not individually named and they move as a unit. 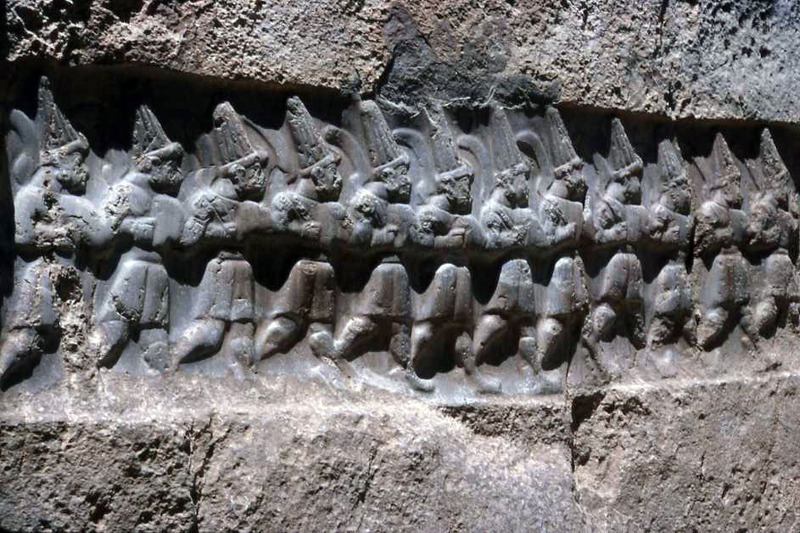 A Hittite cuneiform tablet names eight underworld gods as Aduntarri, Aulki, Irpitiga, Nara, Namsara, inki, Amunk and Aabi (Seehler 2011:114). Relief no. 81 in chamber B, identified by Seeher (2001:Figure 119, 120) as the protective god Sarrumma embracing and leading King Tudhaliya IV. Both the king and his god wear swords with crescent-shaped hilts. 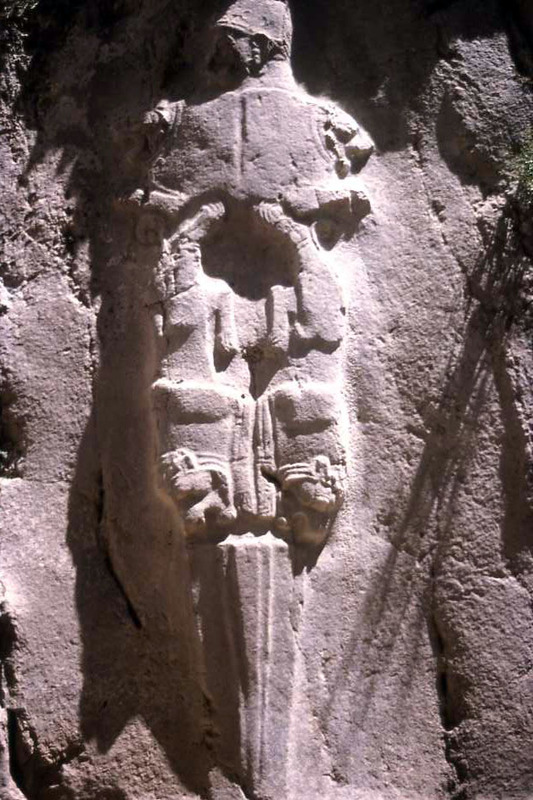 The king's name appears in Hittite hieroglyphs behind the head of the protective god. Relief no. 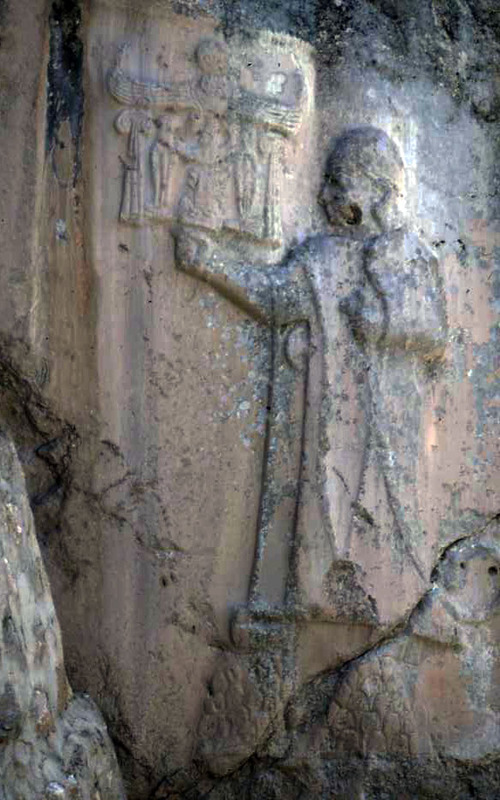 82 in Chamber B identified by Seeher (2011:Figure 122 - 125) as the Sword God. Who was the sword god? Seehler (2011:115) speculates, based on a cuneiform text, that it may be the Lord of Hubsal that is a Hittite parallel to the Mesopotamian underworld god named Nergal. Photographs taken as slides in 1975 by the late Professor Harold Mare (Covenant Theological Seminary) and digitized by Professor Michael Fuller.